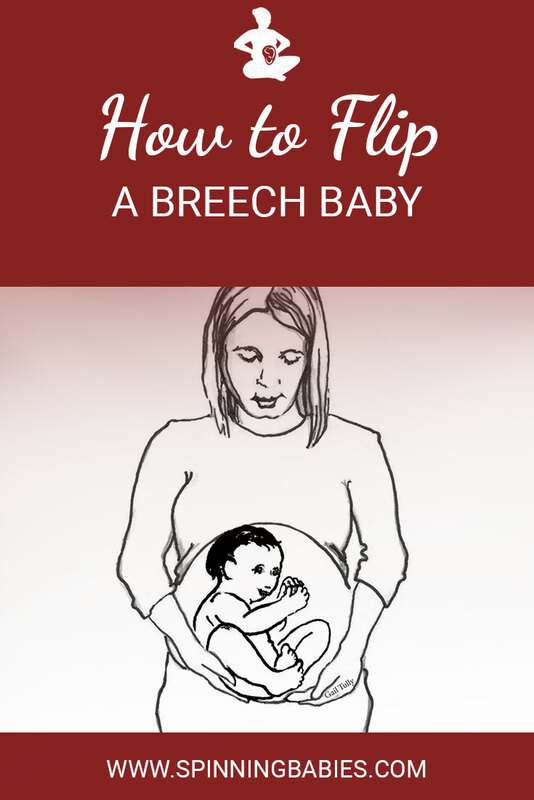 How can you help your breech baby turn head down? Combine these with those on the Daily Activities page and, perhaps more importantly, the Weekly Activities page for a more comprehensive approach. do the weekly activities every day for a week or two. Seek professional body work if you don’t get results after a week or if after 34 weeks, while you call and book a session or series of sessions with someone who understands anatomy and fetal position, such as a Spinning Babies® Aware Practitioner, Chiropractor/Osteopath with Webster certification, or others (see below). These videos may help in small ways to support your baby’s position. For breech, keep reading below! Note: Body balance issues are the usual issues for breech presentation, we observe, but not the only reason! We suggest our “Weekly Activities” on a daily basis when baby is not head down. Learn them free at the website here, but for video detail and more explanation, you may want to buy Daily Essentials for enhancing range of motion and suppleness, and Parent Class in person or on streaming video for the “weekly activities” called Rebozo Manteada and Sidelying Release, and the special “Breech Tilt”. Is there any reason not to add balance? As you increase your body balance, you increase the chance baby finds room or ease to flip themselves head down. Please work with an experienced professional, such as a midwife or doctor, who knows your situation. A professional bodyworker who regularly works with pregnancy (and has special training) come with our highest recommendations. Together you can find a combination of self-care with professional attention that empowers you. Your midwife or doctor may also have advice. Their advice may differ from mine. Print this page and give a copy to your doctor, midwife, and chiropractor for discussion. Ask your doctor if there is a medical reason you couldn’t try some of these suggestions. Opinions aside, these techniques are working for many who do them repeatedly. Each individual begins with their own level of need for balance, some need a little help while others are overcoming twists or tightnesses that need just the very right techniques. We offer techniques that work for most pregnancies with a breech position. Your doctor and midwife can monitor your progress and give suggestions for your situation. Is one or both of your twins breech? Check out my article on Twins. Put yourself in the position you want your baby to be in. Head down! Talk to your baby, heart to heart, and tell your baby what you want – and ask your baby what she/he needs in this situation, too. Maternal positions or bodywork to help my breech baby flip head down? By 30-31 weeks, I highly recommend beginning the Forward-leaning Inversion position to encourage a head-down position. After 32-34 weeks, chiropractic adjustments are suggested. 34-35 weeks is the most successful time to use Moxibustion. If you are a provider or doula or childbirth educator, encourage those you recommend to this page to read how to do the exercises correctly and then they can see when to do them. 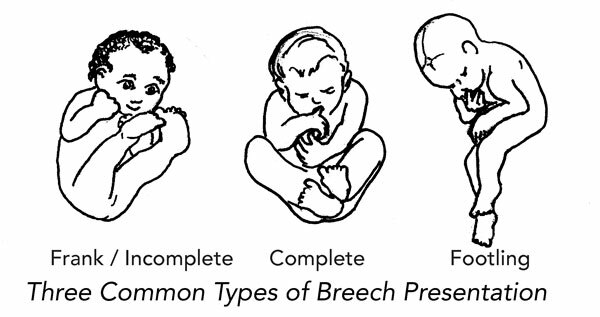 A detailed timeline is given for introducing techniques in pregnancies with breech babies. Look up your weeks gestation and do the suggestions for how to turn a breech baby listed there if you choose. Getting into the Forward-leaning Inversion safely means holding the edge of the surface in which you are kneeling on! Forward-leaning Inversion, when done correctly, will temporarily lengthen the utero-sacral ligaments — it is in coming back up that makes the technique work. We suggest returning to a high kneeling position after FLI. See reasons why you wouldn’t do this on the Forward-leaning Inversion page. Forward-leaning Inversion 5-7 times ONE day for 30 seconds each, about 15-120 minutes apart. Sidelying Release on both sides for several minutes each side. Don’t do one side only! Listen to your baby! Ask baby what they might need you to do to help them turn. Wait gently, not willfully, for an answer. Hypnosis and/or journaling and talking to your baby about the reasons for breech presentation and a resolution for it, if one is appropriate to your situation. Seek professional help to evaluate your thyroid function and seek a natural or medical solution as appropriate. Loose ligaments may be supported by wearing a pregnancy belt. Add a belt if you have had several babies and now are carrying your baby in a breech position. Do the techniques the same. But wear a belt afterward. Explore your body’s response to the belt. It should be supportive but not tight. “Leg Circles” release minor adhesions in the leg socket and allow mobility in the connective tissue. You’ve just made room for the baby doing the things I’m currently recommending. My feeling is to do more rather than fewer. Don’t stress about them, but create a new rhythm of balance and balancing techniques to do often, 3-4 times a day. Get professional help by or after 34 weeks. Breech runs in the family – though it can and has! Having found these exercises not to work may increase emotional stress about having a breech birth. Whether or not the exercises work is not an indication of whether the vaginal breech birth will go smoothly or not. If a term breech mom is considering trying inversions but worries about doing them alone, I suggest getting a practice partner who can hold her and use their help to get in and out of these positions. Read the detailed instructions dedicated to the technique on their pages rather than assume you know the details for safety from this short description. Don’t get upside down if you have high blood pressure or other risk of stroke. Chronic tension in the muscles and fascia can distort bone alignment, spasm and shorten muscles and cause pain. These are things you can do yourself. Below this list are things you can get a professional to help you. Both muscles and fascial are released in these myofascial techniques. You, yourself, or you and a trusted friend can do these techniques with the help of the descriptions listed on the Spinning Babies Techniques page. You can also find a practitioner with skills to take this further and be more effective. Professional help is also available in this category. Depending on the background and style of the practitioner, this may be subtle, gentle or vigorous and rough. I like gentle, fluid myofascial release. Chiropractors may use some myofascial releases integrated in their work. Completeness varies. You can seek out professionals who often add Craniosacral therapy (see next). Some people use foam rollers to release their own muscles and fascia (go back up to Myofascial Release in self-care). We want to let the lower uterine segment (the lower, narrower part of the pear-shaped uterus) expand to make room for baby’s head. Do the Forward-Leaning Inversion for 30 seconds first and follow it with the Breech Tilt three times in one day for a couple weeks. They achieve different goals, so both are indicated. Tuck your chin, which will release the tension in your fascia that could keep the baby from going head down. Inversions for 30 seconds can be done by all pregnant women (see Forward-Leaning Inversion to learn about when NOT to do it). Repeating the Forward-Leaning Inversion frequently is better than doing it fewer and for longer periods of time (start out with fewer seconds if it’s hard). You will find this position more comfortable with repeated use. Do the inversion 5-7 times a day for 1-3 days in a row. Stop earlier if you feel feet kicking more strongly at the top than before. You will feel more pressure in your pelvis, kicking higher and stronger and a new shape to your belly – no more round head at the top! These are some signs that baby is head down. When you feel a change to bigger kicks higher up and a fullness when walking, walk 1-3 miles or 2-5 kilometers a day for 3 days. Resume 1 Forward-leaning Inversion a day begins after 3 days of walks help baby’s head settle lower. Now your work is to help baby to your left side before pushing stage of labor, and fetal rotation is easiest in early labor, but pregnancy balancing continues to increase success in rotation and engagement. Breech Tilt– see the pillows under her shoulders to prevent her neck from being folded! Helping the baby to tuck his or her chin so that baby is able to make the flip. In a steep Forward-Leaning Inversion, the mother’s neck is free to move, helping the fascia over the pelvis be more free to move. You’ll need to hold your shoulders firm so you don’t collapse. Be mindful. The Breech Tilt is well known. Use instead of or in addition to Open-Knee Chest. We want to let the baby’s head flex, so the baby can put his/her chin on his/her chest. This is called flexion. Flexion is the first step before flipping. Just like the gymnast, the baby tuck’s his/her chin before rolling. Get a broad plank of wood, like an ironing board. Prop it at an angle against the couch or a chair. A few pillows stuffed around the base will help prevent tipping. Another pillow goes under your neck. Do not fold your neck, your blood vessels do not like it! Lie on the board with your head down and feet resting on either side of the board on the couch (not shown). Try it a couple times to get it right. A pillow under your neck and not your head will help you feel more comfortable and stable. Remain on the board for up to 20 minutes, 3 times a day. Work up to it, starting with 5-10 minutes at first. After you’ve got this down and you can relax inverted like this, put a bag of frozen veggies, wrapped in a thin towel, behind baby’s head, and a very warm “hot pack” in front of the baby near your pubic bone. Put the warm pack on the same side of your belly as the baby’s hands and feet are on, but close to your pubic bone. Other times, place a paper towel tube in the same spot (your lower right abdomen) and have family members speak through it or play Beethoven. When you think or know your baby is head down, walk a good long walk each day for a couple days. Integrate your Breech Tilt and other activities with the Daily Activities for an Optimal Fetal Position. Can you get in a deep, warm pool and stand on your head? Some sources suggest Open-Knee-Chest for breech, but I don’t think it is as effective without the Forward-leaning Inversion to untwist the lower uterus first (see FLI). The mother’s neck is restricted from movement which in turn restricts the fascia at the pelvis from free mobility. 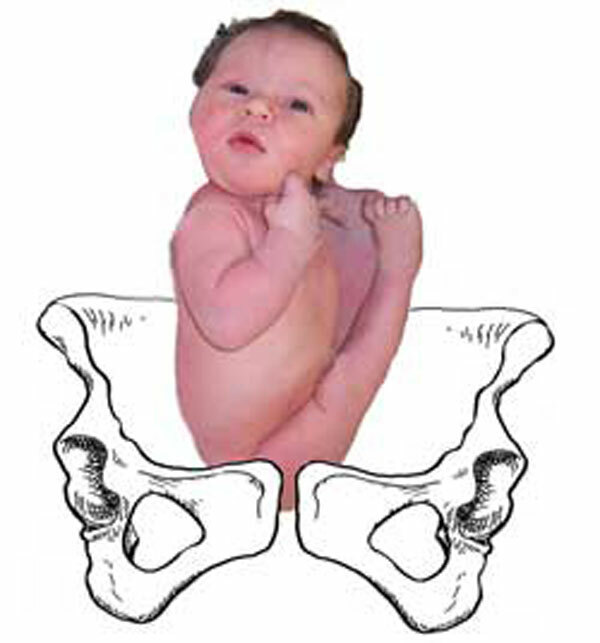 This technique promotes rotation and progress for a posterior or asynclitic baby in labor. This may work but try the others, too. A friend of mine did this for two hours and then plopped over on her bed to sleep. She felt her baby flip right then! In summary, inversions are effective as long as the uterine ligaments are not super tight. If the ligaments are that tight, professional bodywork can release them and give the baby a more flexible home to move around in. If the ligaments are too loose, wearing a pregnancy belt can give your lower belly the slope baby needs to correct their position. A gentle and seemingly passive touch to the fascia of the abdomen lends flexibility and room for the broad ligament and connective tissue supporting the uterus. The baby has room to move! If this is the need for your breechling, this technique can work beautifully. Repeat every couple of days from 32 weeks to birth. Baby can be breech or head down for this technique to be useful. It’s about making room for baby not forcing baby to flip, so it won’t turn a head-down baby back to breech. Also, don’t wear a bra, breath deeply and do Sidelying Release to make room for the head to turn past tense areas of fascia near the ribs, particularly the right side. See the page on Abdominal Release (Diaphragmatic Release). Can’t lay down? See the Standing Sacral Release, which is previewed next. “Release” the sacrum, the triangle bone between your spine and your tailbone (considered part of the spine). The muscles and fascia connecting to the sacrum will soften, lengthen, and the sacrum will become more mobile. Comfort and flexibility result. The baby has room to move! If this is the need for your breechling, this technique can work beautifully. Repeat every couple of days from 30 weeks to birth. Baby can be breech or head down for this technique to be useful. It’s about making room for baby not forcing baby to flip, so it won’t turn a head-down baby back to breech. See simple directions on our Standing Release page or see it demonstrated on Spinning Babies; Parent Class. This “myofascial release” supports the above techniques. you can find the “how-tos” at our Sidelying Release page. The baby has room to move! If this is what your breechling needs, this technique can work beautifully. Repeat a couple times a week from 20 weeks to birth. It’s about making room for baby not forcing baby to flip. 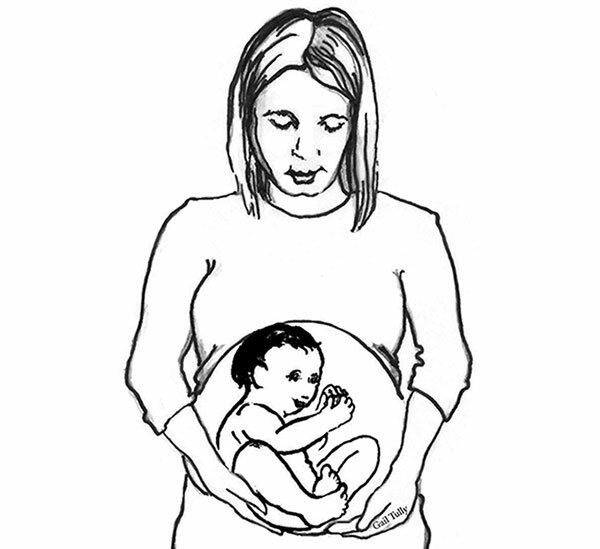 Sidelying Release won’t turn a head-down baby back to breech or an anterior baby to posterior. Use with Forward-leaning Inversion for best results. Continue Standing and Sidelying releases after baby flips. A technique of heating acupressure points with the glow of mugwort sticks (compressed mugwort herb in a thick, incense-like stick), moxibustion has been shown to help breech babies flip. The mugwort herb in the sticks makes a lot of smoke. You can do this outside, even when using “smokeless” moxa. Studies have shown that using it a few times a day in weeks 34-35 have the best rates of flipping breech babies to head-down positions. You can do moxibustion at other weeks gestation also, but the studies that showed the most success were done during the 34th week. Moxibustion is also helpful for rotating a posterior baby towards the anterior. Here is a well done “how-to” video from Raeghan Siemens, a registered Acupuncturist at Living Wellness Centre in Surrey, British Columbia. Let’s do some gentle things to help baby be head down before labor! Maternal positioning, journaling, emotional exploration and using professionals to help with pelvic adjustments, abdominal and sacral releases, homeopathy, acupressure and acupuncture, hypnosis and moxibustion have been shown to be effective. I recommend professional help at 34 weeks for the best success. This opinion is shared by Oxorn and Foote in Obstetrics Illustrated. Add body work such as craniosacral release with myofascial release, chiropractic, Maya Massage; all with practitioners who the community recognizes as those to go to in pregnancy (it’s important that the practitioner not only see pregnant women but that they see dozens/hundreds of them). Traditionally, the Central American Maya midwives give pregnant women a massage and do sifting with the Rebozo (Manteada y Sabado) every 15 days in pregnancy. The hips or abdomen are wrapped with a long, thin strip of linen to support the lower abdominal wall when walking and traveling about. Breech was extremely rare when Anthropologist Brigitte Jordan was interviewing midwives there in the last century. Here is a youtube video of my friend, Midwife Angelina Martinez Miranda doing the rebozo and massage during her prenatal care with a woman whose baby is lying sideways. The nutritional and herbal advice, the kindness, the personal approach – all these I love. Enjoy the video! Many chiropractors can loosen the ligaments by doing the Webster Technique. Adjusting the sacrum, for both a vertical twist or a buckled (horizontal wrinkle) sacrum will let the baby put their head down more readily because the bones won’t be in the way. Any other alignment necessary, such as the neck and jaw, to help the pelvis and SI joints stabilize. Muscles and fascia are released in this holistic and gentle approach. Dr. Carol Phillips, DC, is the creator of DBB. See our video for her introduction level workshop for providers of pregnancy bodywork and doulas. Beyond being a relaxation help, a good therapeutic massage therapist can become a community star among pregnant women and their caregivers. We have some gems in our town. Again, seek the person whom everyone knows and croons over. The respiratory diaphragm, inguinal ligament, and jaw muscles never felt so good. You’ll know you have moved beyond the conventions of culture when you thank your massage therapist for rubbing your buttocks. But hey, that’s what was pulling and twisting the pelvis! Make room for baby by softening and balancing the support structures of your entire body! Seek a homeopath to select the right remedy and the right dose for you and to monitor for side effects, if any. Look for experience and high-level education. While there are simple points that might work for some, other women will need someone with advanced skills. Acupuncture has been studied for flipping breeches and found beneficial. Within the realm of Chinese Traditional Medicine, acupuncture is an ancient and effective way towards balance. The thyroid can be helped through this modality, too. Low thyroid is associated with fetal malposition. One of the key techniques when self-care and chiropractic do not work within 1-2 weeks. This is a very gentle and subtle “release” of the fascia supporting the skull and pelvis. Again, when the mother is in balance the baby will move into the most ideal position possible. Dr. Carol Phillips, DC, teaches a unique blend of myofascial release and craniosacral therapy she describes at DynamicBodyBalancing.com and I highly recommend this approach. Add psoas resolution and alignment to keep the balance you create! Hypnosis has been useful for many women to help flip their breech baby to head down. Phyllis Klaus, one of the founders of DONA International doula organization has used hypnosis to help women figure out why or what happened that their babies went breech. This starts the release that often leads to the baby flipping. A Hypnobabies member shares the benefits of Hypnobabies hypnosis for fetal positioning at InexplicableWays.com. Hypnosis is excellent for turning a breech, since the baby is registered by the inner mind as part of the mother! In this deep hypnosis Turn Your Breech Baby audio track, you are allowed to relax the muscles and any constriction all around your baby and use effective hypnotic suggestions for turning baby to the vertex, (head down) position, if that is the safest way for baby to be positioned. Baby will let you know! Excellent for midwives to keep for their home birth and birth center mothers, as well as *anyone* whose baby has turned to Breech presentation in late pregnancy or labor. …Since the baby and the mother’s physiology, hormones and brain chemicals are so intimately connected during gestation, what impacts the mother impacts her baby. It is not a huge leap to think that a mother’s emotional state could impact the baby’s positioning. The verbal and non-verbal communication between a mother and her care provider impact the mother’s beliefs about herself and her abilities, impacts her emotions, brain chemicals and physiology and absolutely can impact her physical circumstances. The mind-body connection has everything to do with how a mother and her baby travel through childbirth. Babies feel what their mothers feel…experience the emotions she experiences because they get a ‘dose’ of her hormones and brain chemicals while being bathed in the amniotic fluid she replenishes every 3 hours. This is what APPPAH researches and teaches about and it’s fascinating (https://birthpsychology.com/). “Hypnotherapy [suggestions/words that impact a mother’s mental and emotional state] may help pregnant women turn their breech baby around to the normal head-first, or vertex, position. A researcher at the University of Vermont, Burlington, used hypnosis with one hundred pregnant women whose fetuses were in the breech (feet-first) position between the thirty-seventh and fortieth week of gestation. The intervention group received hypnosis with suggestions for general relaxation and release of fear and anxiety. 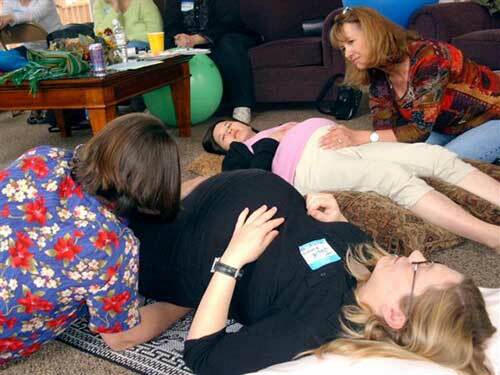 While under hypnosis, the women were also asked why their baby was in the breech position. These techniques work for most babies, but not all. Some women will choose an external cephalic version (ECV). Babies death rate from ECV makes it a technique that should be done only by skilled practitioners (for whom that rate is taken from) who know how to listen to babies before, during and after. Again, trust your gut to whether this is a choice you want to take. It can be an easy and simple procedure or, rarely, it can be heartbreaking. Continue with daily Body Balancing as well as these special activities for breech flipping. You may also agree to go through with a cephalic version (the doctor manually turns the baby head down through your abdominal wall). While there is some risk to this procedure, it is recommended widely. If the above techniques don’t work, they may have loosened the surrounding womb and uterine support structures to make the ECV easier. Spinning Babies techniques do not include manual cephalic version or any manipulation of the baby. This video is included to show what is possible and what is recommended by most physicians. Risks include separation of the placenta, baby’s oxygen source, so please don’t attempt a manual cephalic version with a well-intentioned friend or inexperienced bodyworker or student midwife, doula, etc. Close monitoring of the baby is necessary to know if you should stop and let baby be breech. External Cephalic Version is about 50% successful in the study setting (preparation with body balancing is not included in the study methods). It may be more successful as early as 32-34 weeks pregnant, but two reasons prevent providers from widespread agreement to do versions so early – one, baby may flip back to breech (so that’s a reason to balance the uterus first! ), and two, if the placenta is accidentally detached, baby may not be mature enough to avoid the neonatal intensive care nursery (another reason not to do a version outside a hospital and certainly without monitoring). Gentleness and listening to baby are the two best ways to approach this technique. I suggest getting chiropractic, myofascial and acupuncture, homeopathy, and/or moxibustion before the version in hopes that loosening up your broad ligament, lengthening the round ligaments and helping return your body to balance will let baby be turned as easily. If your baby was breech and is now head down you can stop the inversions for a few days. Now walk briskly for a mile, or more, every day for three days, to get the head into your pelvis. After three days of walking, resume myofascial releases to continue the balance that will help baby stay head down and rotate more readily once labor begins. When the baby flips, you may or may not notice the baby flipping. You might tell if the breech flips by feeling feet kick where the head had been before. USUALLY, the strongest kicks are from the legs, not the arms, and will be high in the womb when the head is low. An anterior placenta (one that gets on the front of the womb) can block the baby’s limb movement and confuse people who are trying to tell the baby’s position. More often, a mother will notice a difference in how she is carrying the baby. Notice where your baby is kicking. If that is quite different and is now strong at the top of your womb, you may want to stop measures to flip baby. If the same, you may want to continue until you can get the midwife or doctor to verify the position. What if I think my breech baby has flipped head down but I’m not sure? If you think the baby may have flipped head down, but you aren’t sure, you can either cease doing inversions until you know for sure, or simply hold the Forward-Leaning Inversion position for only 30 seconds, or 3 long breaths. If baby is head down, will baby flip breech if I do a Forward-Leaning Inversion? I think it unlikely that your baby will flip back to breech after balancing your body unless the muscles and ligaments tighten up again. That said, keep your Forward-Leaning Inversion short and do it only once a day. Don’t do the Breech Tilt if you think baby may have gotten head down. Walk! If you have a lot of amniotic fluid around your baby, so that a doctor needs to see you often, you should do other balancing activities like the Sidelying Release. Whether the baby flips on their own, or with the help of an experienced midwife or doctor, the newly head-down baby is often in the right occiput posterior position. A daily Forward-leaning Inversion can continue to help the baby get into an even better position for the start of labor. Remember, head down is only half the story! Balancing techniques could help a vaginal breech birth go more smoothly. Always use physiologic breech birth practices (Knee-elbow or hands-and-knees maternal position, hands-off the breech, natural childbirth). Otherwise, a cesarean after labor begins gives the baby a bit of labor hormones to help transition into life outside the womb. Discuss these options with your midwife or doctor. There is currently better data in obstetrics to support physiological breech vaginal birth. Please go over all the recommendations including body work. Consider that another week of healthy gestation, to 40 weeks, has nothing but benefits for your baby. If you or baby are not healthy or if there is a prolapsed cord, you need medical help. But a prolapse cord is a different issue with a breech than a head-down baby and getting bottoms up and riding to the hospital is likely to lead to an excellent outcome. Keep reading, keep balancing and keep talking about what is beneficial for you and your baby with your provider. Read a story about the Window of Opportunity for Flipping Your Breech Baby. I just wanted to let you know that I appreciated your help, and that at 34 weeks, me, my chiropractor, and my midwife are all pretty sure that the baby has flipped head down, to what your site basically calls a LOT position. It was a week long process that wasn’t complete until I had done 3 webster appointments, plus a bunch of inversions, plus doing your “daily activities” on your DVD every day, but it seems to have worked! -Rebekah B.
I recently found out my baby is breech. This is a 2nd baby. My first was a very calm baby and was always head down. This one is QUITE active and apparently flipped in the 4 days between my midwife appointment and an ultrasound (they thought my placenta was low… it’s ok). I exercise 3-5 times a week. I eat well and am in good shape. I am seeing a chiropractor … Initially, saw her for “shifty hips” that would pop out of joint… hasn’t happened since. My only pregnancy problem (with both) is uterine irritability… I’ve tried cramp bark tea for this but usually the only solution is to sit down. If I don’t nip it in the bud, it progresses to quite strong contractions where I vomit. My uterus is often quite tight for hours on end when I am walking around or at work (I’m a nurse). I was much worse with my son (they kept thinking it was preterm labor but my cervix never opened). Of note, he was a very quick and easy labor/ birth (less than 4 hours)– maybe from all the uterine toning? The Chiropractor did a Webster Maneuver once; usually she is cracking my back and neck and hips and such. Should she be doing Webster every week? What should I be expecting from her? I’ve never seen a Chiro before. I haven’t seen her yet since the baby flipped. How does my uterine irritability play into all this? My midwife said I had very good abdominal tone also. Is this hurting things? I’m being more diligent about my posture now and I’ll start some tilts/ inversions (already doing pelvic rocks). I’ll see if my husband can try the Rebozo sifting on me– would a Maya wrap sling work OK for a scarf? Any other thoughts/ suggestions? Thank you so much for your time! I better go do my pelvic rocks– the baby is dancing around in there! Your contraction symptoms and baby’s breech position seem to match the picture of asymmetrical ligaments. The Webster Maneuver would help the round ligaments. The Inversion will help the cervical ligaments first and then help the broad and round somewhat. Pelvic adjustment releases any possible pulls on the ligaments supporting the womb from even a slight misalignment of the pelvic joints. Get the abdomen ligaments relaxed and then supported. A pregnancy belt may help the looseness that makes it hard for the baby to have a toned slope to settle head down on. When a baby is breech the first action is to relax a twist in the womb using the above methods. The Webster Maneuver is a gentle press on the round ligaments in a specific direction to soften the ligament. It takes a just a few moments and will soften a cramp, spasm or even “good tone” to allow the baby to flip past the ligaments into a head-down position. Releasing a kink or tightness in the round ligaments also helps the uterus become more symmetrical, which also helps baby into an ideal starting position for labor. The Webster can be done repeatedly, weekly or bi-weekly if in the last month or two. It is one step in helping a breech baby flip. Sometimes it is the only step needed, especially if repeated about 3-4 times. But sometimes you need more body work or self-care to flip a breech baby. After a sacral release, you may wear a belt as much as possible to support a loose abdominal wall. There are other ways to help uterine “irritability” as well (scroll down on this page!). Good tone may be good tone or too tight a broad ligament. We use that phrase a little loosely in our desire to say positive things, and in ignorance of the myofascial clues among those of us untrained in this type of bodywork. It would take training to tell the difference, I think. A tight broad ligament often goes along with an asymmetry in the round ligaments. Releasing it helps the baby turn past it. Carol Phillips, DC, who taught me about the myofascial world, says that premature contractions are often solved by a sacral release (standing sacral release). The moms that I have referred to have this type of bodywork done have found it to work. I also suggest a high protein, whole foods diet with plenty of leafy greens, yellow veggies, Omega 3s, liquids and salt-to-taste (Brewer Diet and then some). Using the Rest Smart positions will be helpful, of course. But probably not enough to help baby flip on his or her own after 32-34 weeks. But you have a clear idea of several things you yourself can do, and the body work that will help. Continue with the Inversion. I suggest the method of getting upside down shown in the inversion video on the blog. A sling for a Rebozo helps relax the broad ligament if you can relax your belly into it like a hammock and your partner can lift the weight of the baby off your spine without scrunching the baby into your spine. And then start slowly to do short jiggles until your involuntary muscles can relax. About 3 minutes. Repeat daily as possible. Using a sling, sheet or any long, broad woven material can be substituted for a Rebozo. Your clarity on your ability to birth a breech baby is one of several aspects of safety for breech vaginal birth. Important physical assessment will help determine if a vaginal breech birth might be safe in your situation. Searching out an experienced midwife or physician in breech birth is a challenge, but a necessary one if you decide to have your baby naturally at home or in the hospital. You will have to ask at midwifery circles, homebirth support groups, cesarean prevention groups, and teaching hospitals for referrals. Having an experienced person reduces the risk to breech birth but doesn’t eliminate the risk, of course. Finding someone who can sit on their hands for the first half of the birth is a good start. 3-4 cups of bulk red raspberry leaf tea daily. If you don’t have sensitivities to dried herbs, that is. The bags of RRL are too old and lack oil. The bulk herb is more effective, go to a co-op, though, for “fresher” dried herbs. Use 2 TBSP in a wire mesh strainer and fill a quart jar with ALMOST boiling water to steep for 5-6 minutes only. Remove herb and drink hot or cold, straight or with a splash of apple juice, or other herbal teas (There’s no caffeine in bulk RRL). Eat plenty of protein, but watch the peanut butter! It’s hard for a pregnant liver to process. Drinking a total of 3 quarts or more is almost always necessary for pregnant women’s health. Check for a calcium magnesium supplement that is easy to absorb. Wear a snug pregnancy belt. If your baby isn’t head down and you are later than 32 weeks, you may like to try the methods you can use at home, the Rebozo, the Inversion as well as the Rest Smart positions in Pregnancy Posture. Some mothers wait to try these techniques until they are 34 weeks. Talk to your midwife about these suggestions to help your baby flip. You are doing everything right.